The beauty insider’s secret, IT Cosmetics was created by a former news presenter who was on the hunt for make up that would stand up to unforgiving HD cameras – and IT’s brushes have since become renowned and celebrity-endorsed for their impressive design and finish. This dual-ended tool allows you to effortlessly and flawlessly apply your favourite foundation and concealer in a flash with its dense and fluffy heads that make application a dream come true. Featuring ultra-plush, award-winning Heavenly Luxe synthetic hairs, this dual-ended tool does all the work for you, applying your favourite liquid or cream foundations and concealers. Each end will airbrush your products to perfection while the tapered concealer brush effortlessly smooths areas of concern such as under your eyes, around your nose and other hard-to-reach spots. Perfect for stashing in your handbag or carry-on for easy, on-the-go application and touch-ups you’ll quickly notice this become a daily essential and your go-to tool. Using the flat end, blend your favourite concealers and foundations onto large and/or hard-to-reach areas of your face. Using the large and fluffy end, buff your favourite liquid, cream and powder products onto large areas of your face in circular motions. This brush is so plush, bristles are silky smooth, I can’t get it off my face once I start blending. It leaves no streaks, it’s multitasking, love the lightweight and compact feeling, just perfect! 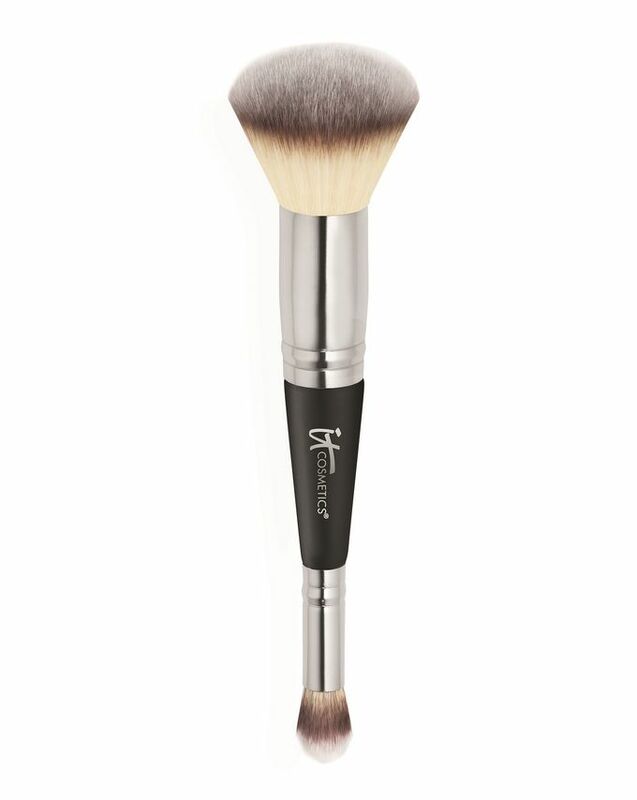 It's a really great brush - soft and dense to use as foundation brush. It spreads the foundation evenly and leaves no streaks. Surprisingly both sides are just perfect - the small one is great for corrector, especially under eyes. Am I the only one in the world who don't like this brush? I was looking forward to try this brush. When i applied my favorite foundation, my skin looked flaky, patchy and it unevenly spread my foundation. I use it as a cream blush brush and as a highlighter brush on the smaller side. It is extremely soft, easy to apply products and easy to clean. It would probably be a great brush to apply foundation as well. I clean my brushes at least twice a week and I haven't noticed any signs of wobbling or damage. Highly recommend! Before having this brush I always used my beauty blender to get that flawless base for going out/ occasion however since I have gotten this brush I haven’t touched my beauty blender because it’s so easy to use - don’t need to wet/ brush anything. It makes having a flawless base and applying foundation soooo easy. LOVE THIS BRUSH!!! Perfect brush for foundation! It’s very soft but dense enough to spread foundation evenly and it leaves no streaks. I thought I’d never find a brush to replace beautyblender but this one exceeded all of my expectations. Highly recommended. Really Good brush, both ends. Perfect size and shape, soft and at the same time dense enough. Applies foundation and concealer beautifully even on dry face areas like my cheekbones and undereyes without feeling scratchy. Highly recommend! The IT Cosmetics brushes are to die for. They’re nicely weighted with the fluffiest bristles, and they wash really well. I don’t usually rate dual ended brushes but this is great for foundation and concealer application. So nice and perfect combining brush! Have it with me at my trips, always. Soft brush that blends the foundation and concealer perfectly. This is the best brush I’ve used so far. Both sides are perfect which is so rare to find in dual ended brushes. So soft and no shedding so far. This brush is amazing for concealer and foundation. You can use this for so many things and it’s great for travelling as it’s two in one. This is expensive but in my opinion it’s worth it. My most used brush at the moment and it’s also a great quality brush! This is the only brush I own from IT Cosmetics. I must say that I'm very glad I've purchased it. Both brushes are really good, and I can honestly say it's my favourite when applying foundation and concealer. I loved this brush is perfect and smooth. One of the best ones I own! Superstar! I highly recommend this, as it is simply amazing. I've never been able to apply liquid foundation with a brush before, no matter the brush type or technique, but this applies it beautifully and it is so so soft. No more cake face, enhanced dryness, irritation or streak marks! It's great for both powder and liquid foundation and perfect for travel. The concealer end is equally beautiful. Love that it's made of synthetic bristles and is cruelty free.